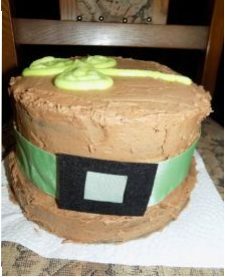 St. Patrick’s Day Cake – Create, Make & Bake! I got so mad with this, I was in a bad mood yesterday anyway, but this made me quit baking…., for a whole 5 minutes. I thought it failed but I managed to bring it back, just about. The same amount of, butter, sugar, self-raising flour. 1. Cream together the sugar and butter, then add 1 egg and 1/6 of the flour and mix well, keep doing that until there are no more eggs or flour left. Add in the vanilla and cocoa powder. 2. Preheat oven to gas mark 5/ 190*C/375*F. Grease the tins and place the mixture in them, leave enough for a second section of top of the hat (the smaller tin). Bake the wider but shallower for 25-30 minutes or until a skewer comes out clean, bake the deeper but smaller one for 35-40 minutes or until skewer comes out clean. Repeat with the leftover mixture in the smaller (deeper) tin. Leave to cool. 3. (This is where I messed up the first time, I messed up every step -_-) After the cakes are completely cool, TAKE OFF ANY ROUNDNESS. Sandwich the layers together, (the wider one being at the bottom) with the buttercream, make sure that the buttercream ISN’T RUNNY (like mine was). After that, cover the cake in buttercream and smooth it out. 4. Decorate however you want with the green icing, I did a huge clover (shamrock) on top. Done! That looks fantastic, perfect for St. Patrick’s day, l love the shamrock.